Imagine a cross between the shows Off Camera with Sam Jones and NPR’s Tiny Desk. Picture the best musicians in the local scene performing and being interviewed at neighborhood venues. And then envision yourself being part of a live audience. For music lovers in Rochester, this is a reality. Music journalist Dan Gross has devoted the past year and a half to bringing this vision to life. Rochester Indie Musician Spotlight highlights the best of the rich and diverse music scene in Rochester, which was recently voted best music town by staff in the Best of NYS Music poll. With an exciting lineup of guests and the support of sponsors, Rochester Indie Musician Spotlight’s “Season5” promises to be exciting. “We want to make this the biggest season yet,” Gross told NYS Music. During the off season, he lined up a slew of talented performers. To support the expansion of the program to sixteen episodes, new and returning sponsors are pledging support. One of the new partnerships has led to the creation of a spin-off series. To top it all off, a fundraising campaign this month may make it possible to to air the series on television, in addition to the web. “Season 5” will showcase sixteen musical acts representing a variety of genres. Among the guests slated to appear are Grammy-nominated jazz saxophonist Jimmie Highsmith Jr., beloved folk band The Honey Smugglers, blues singer/pianist Hanna PK, and comedic songs by Small Signals from their Missed Connections album. This season concludes with the series’ landmark fiftieth episode. The majority of episodes are filmed at Bop Shop Records, an independent record shop that carries a wide array of music and specializes in fine condition vinyl. Serving the community since 1982, the shop was originally in Village Gate and is now located at 1460 Monroe Ave. It was the first sponsor of the Spotlight, a partner since the second season in mid-2016. 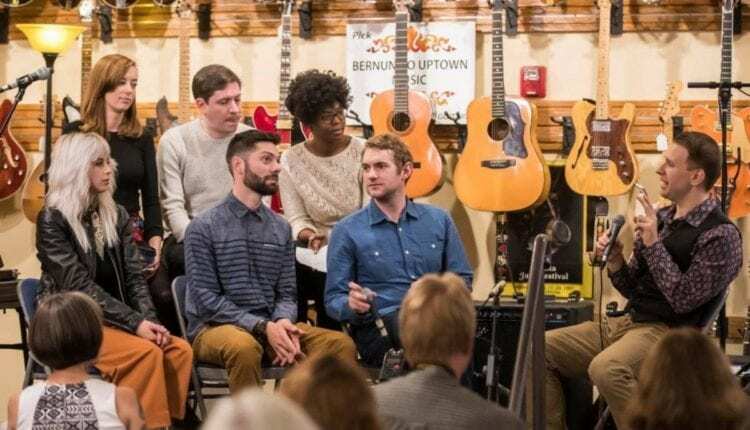 Gross is grateful for the the shop’s owner, Tom Kohn, as the use of venue space allowed the show to expand from a straight interview program to a mixed interview and concert format. Over the previous four seasons, the show has featured some of the best of the pool of talented independent musicians with roots in Rochester. Spotlight alumni include Ben Morey & The Eyes, Lost Wax Collective, The Crooked North, Daniel Bennett Group, Talking Under Water, The Mighty High And Dry, and Tart Vandelay. The longevity of Rochester Indie Musician Spotlight can be credited to both the quality of programming and the high standards established by Gross. After graduating college with a double major in Broadcasting and Music, he has found many outlets for his talents. He has bylines as a writer for the Democrat and Chronicle and Eastman School of Music. He’s on the crew of the local web show My Hometown. You can also find Gross hosting and producing the music interview podcast “Extended Harmony” for jazz record label Outside In Music and hosting a show on Jazz 90.1 on Mondays from 6-8pm. Gross started Rochester Indie Musician Spotlight because he wanted to find a way to combine his broadcast journalism skills with his deep appreciation for the Rochester music scene. The show has grown from humble DIY beginnings with Gross conducting interviews and friend Stacey Baran on camera. Gross has operated the program on a shoestring budget, learning how to do a multitude of technical tasks himself, including audio mixing and color correcting video. He still tries to do as much as he can to contain costs. He’s deeply thankful to everyone who has helped the program to grow. From videographers Jason Thibault (producer of My Hometown) and Dallas Greene to a growing number of musicians, viewers, and sponsors. “This show is not possible without other people,” said Gross. In addition to connecting musicians with an audience, the show promotes local independent businesses and venues which promote the local music scene. 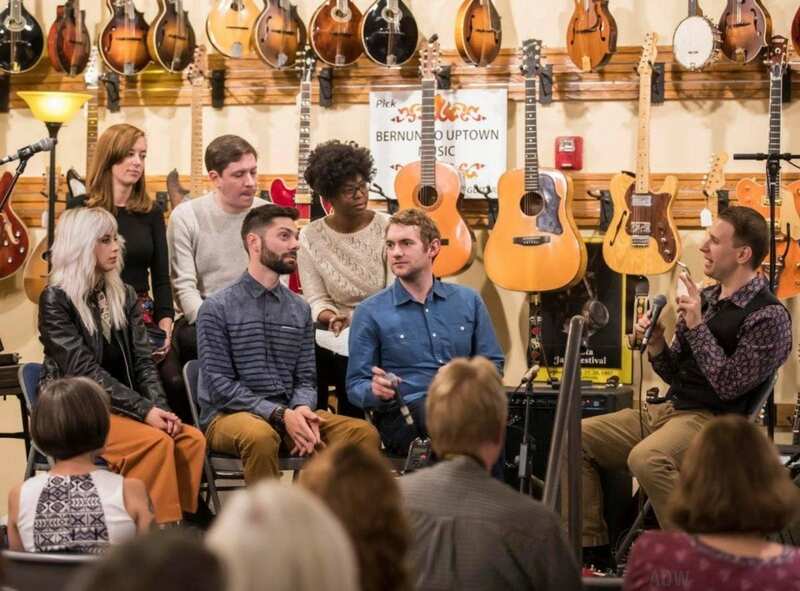 Bernunzio Uptown Music, a shop renowned for its quality vintage instruments, has hosted some of the Spotlight shows. Rowe Photo, Video and Audio, a place where Gross has bought some of the equipment he uses to record the sessions, was also an early supporter of the Spotlight. Gross has been announcing new sponsors who will also be backing the program this year, including restaurant and roastery Joe Bean Coffee Roasters which features live jazz weekly and instrument sales/rental/repair shop Sound Source. There’s also a new partnership with Three Heads Brewing which launched a monthly series The Rochester Residency. The “Spotlight Spinoff” videos will highlight featured artist of the month. The first installment of the “Spotlight Spinoff” with this month’s resident Fran Broderick was released last week. In the debut episode, Gross and Broderick chat at the brewery about Fran’s musical background. Broderick also gives viewers insight into the plans for his sets every Thursday in January: a week doing an acoustic set, another week with his band Friday in America, the third week playing Warren Zevron’s Excitable Boy with a handful of musical guests, and releasing his new album on the final week. The interview is book-ended with some clips of Broderick playing his original songs on acoustic guitar. In addition to local business owners, viewers can also become patrons of the show. Donors to the Spotlight’s first crowd sourcing campaign are entitled to a variety of perks at various levels, including t-shirts, coupons or swag bags from sponsors, and being recognized in show credits. If the indiegogo fundraiser reaches its target of $3,500, it will enable Rochester Indie Musician Spotlight to make the leap to television. Airing on television as well as being posted to the internet will help the show reach a wider audience. “If everyone who has ever “liked” the Facebook page gave $5, we’d reach our goal,” said Gross. During the countdown leading up the highly anticipated “Season5,” Gross is replaying some of the episodes from the first four seasons. You can find them on Facebook at Dan Gross: Music & Journalism . Hit the follow button to get the scoop on upcoming events and new episodes. Ben Morey & The EyesBernunzio Uptown MusicBop Shop RecordsDan GrossDaniel Bennet GroupFran BroderickHanna PKJimmie Highsmith Jr.